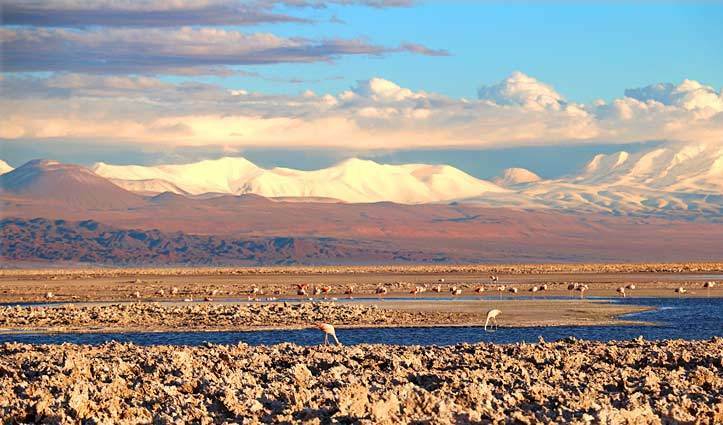 The Atacama Desert is the second driest desert in the world after Antarctica’s Dry Valleys. When my colleagues suggested I should include the Atacama Desert to my itinerary, I have to admit I did wonder “What on earth is there to do in the Desert?” however during my stay I quickly realised the more appropriate question should have been “How do I fit it all in?” Below are my favourite excursions and a glimpse of the diversity of this fascinating region. 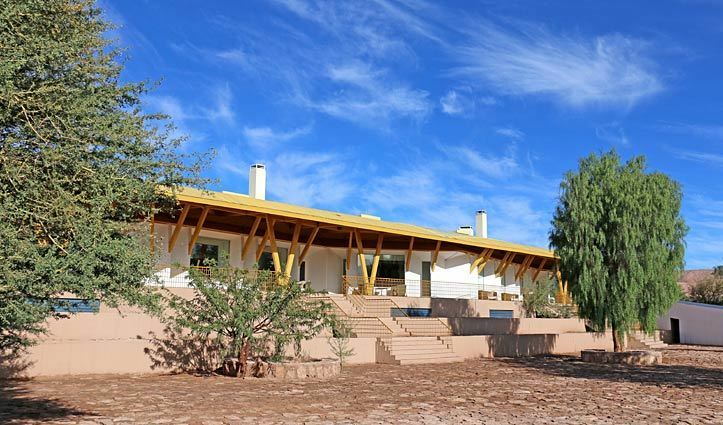 My visit began with a two hour flight from Santiago to Calama then a one hour transfer by road across the arid plateau to San Pedro de Atacama, a quaint town located around an oasis in the Atacama Desert. The adobe buildings, rugged roads and gauchos on horseback give the impression you are in the Wild West and the surrounding rock mountains resemble scenes out of an Indiana Jones film. 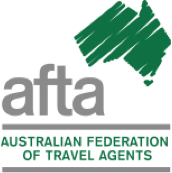 Despite the rustic feel of the town there are many luxurious hotels available which offer comfortable and tastefully designed rooms, beautiful grounds, fine dining and excursions with expert guides. Exploring the Atacama Desert on horseback was an excellent introduction to the Atacama’s incredible beauty and diversity. Bright blue skies and snow-capped volcanoes were the backdrop for my adventure. 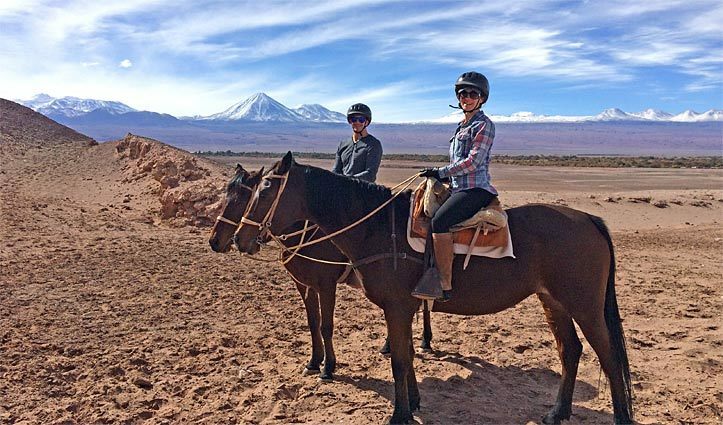 My ride began in San Pedro de Atacama at explora Atacama; which is renowned for its gentle and well-schooled horses, perfect for a beginner like me, or for more advanced riders wanting to cover a bit more ground. This was a great activity for my first day in the desert as it let my body acclimatise to the altitude and enjoy the remarkable scenery whilst my steed did most of the work. To really appreciate the splendour of the Moon Valley (Valle de la Luna) in the Atacama Desert it is nice to explore by foot. Our walk took me along high ridges and down through valleys, all the while admiring stone sculptures, sand dunes and geological formations beautifully carved by the elements. 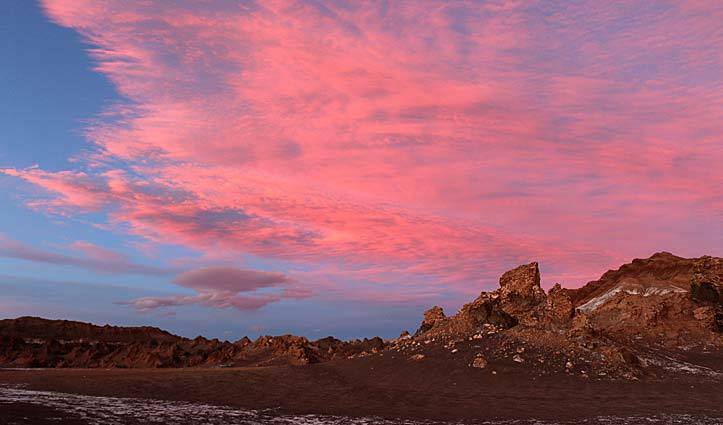 As the sun set I was treated to a light-show of soft pink and red hues reflecting off the rock and petrified salt crystals. These conditions offered incredible photographic opportunities. This hour long hike took me across the highlands of the Atacama Desert amongst 5m tall cactus, some which are over 900 years old. 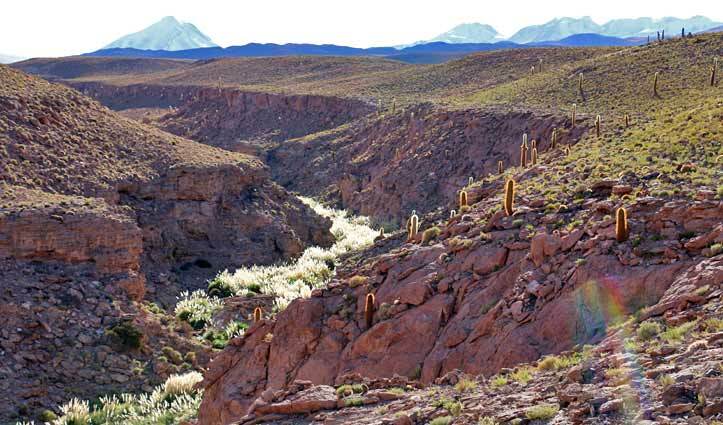 The trail then descended into a gorge and began to wind through the reeds skirting the stream; the lush conditions were a stark contrast to the parched altiplano just above the ridge. 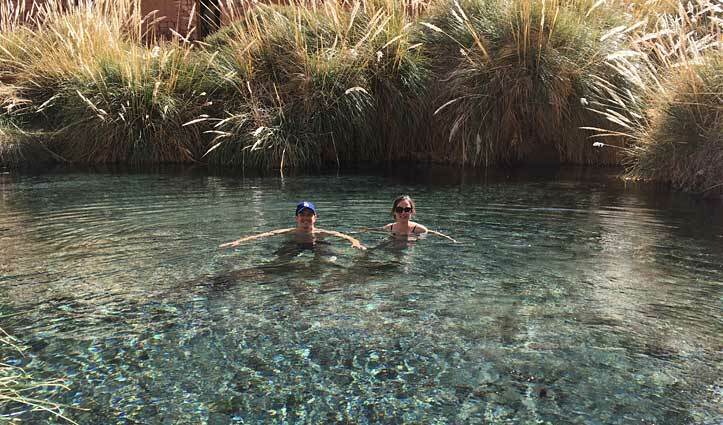 Eventually the track took a turn and led us to crystal clear natural hot springs marking the end of our hike. Our driver from explora was waiting for us with our bathers and robes so I quickly changed to enjoy a well-deserved soak in the temperate water. As guests of explora we had our own private pool and were spoiled with delicious snacks and a glass of sparkling wine or a beer. This was the perfect way to end the morning. 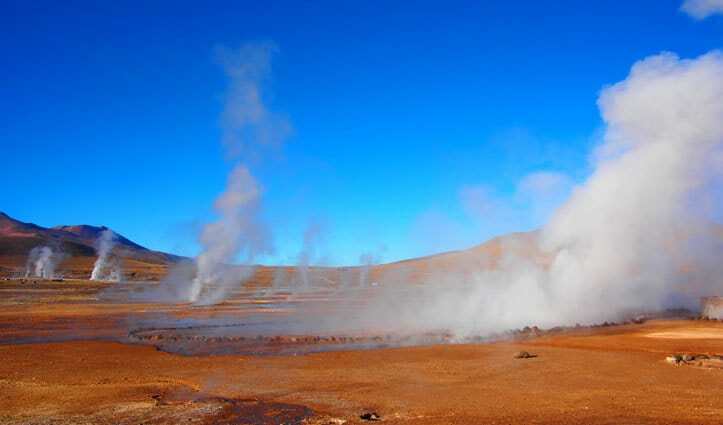 This excursion is best done after some acclimatisation in San Pedro de Atacama as it reaches an elevation of 3,500m. Fortunately the springs are accessible by road and we were taken back to explora by van. One afternoon we drive out to the salt flats which took us through the village of Toconao, with its picturesque church, then onto the salt flats. Our guide had some binoculars which he shared around so we could get a closer look at the pink flamingos and other bird life in the ponds. After a walk around the salt flats we enjoyed a drink and some snacks as the sun set. It was an early start, before dawn, to enable us to reach the Tatio geysers for day break. This is the best time to see the steam rising out of the 80 geysers leaving a lasting impression and offering incredible photographic opportunities. Located at an altitude of 4,321 metres above sea level I needed a few days to acclimatise before visiting this site and I made sure I rugged up as it was quite cold. However once the sun was up I donned my bathing suit and took a dip in the pools of hot water which we were able to bathe in. On the drive back to our accommodation we were lucky enough to spot some vicuñas. Another early start had me clambering aboard a hot air balloon and soaring high above the Atacama Desert where I was able to view many of the places I’d visited during my stay. As the sun rose over the volcano I was able to admire the oasis of San Pedro de Atacama, the Moon Valley and the salt flats off in the distance. This flight shows off the contrast of region and from this perspective it was very clear it’s not just your average desert but an incredibly diverse and interesting environment. To celebrate our safe return to earth we were rewarded with a glass of sparkling wine, a very fitting end to an exhilarating few days in the Atacama Desert. Flight duration: between 45min – 2hrs depending on weather. 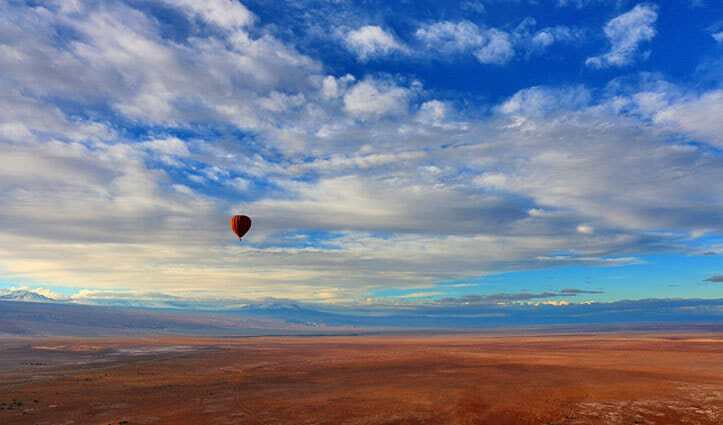 Note: Since this article was written there is no longer hot air balloon rides available in the Atacama Desert. 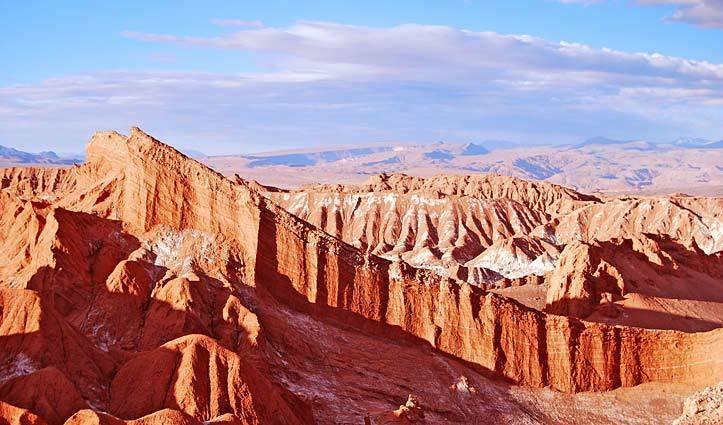 For details on any of these excursions in the Atacama Desert or to book a tailor-made trip in Chile contact South America Travel Centre 1300 784 794 or email: contact@satc.com.au.